Position Actuated Switches Application: to enable moving parts of machines to be positioned, controlled, or monitored Actuation: plunger, plunger with ball, roller plunger, roller lever, rocking roller, wire roller, spring rod, plus many variations on these themes and a choice of materials. Hazloc certifications: cCSAus, ATEX, IECEx, GOST-R, Inmetro. Typical Models: ExST13, Ex14, ExT356 More information: Tell us about your application. Safety Interlock Switches Application: to enable sliding, hinged and removable guarding devices on machines to be monitored. Actuation: coded actuator attached to moving part. Hazloc certifications: cCSAus, ATEX, IECEx, GOST-R, Inmetro. Typical Models: ExST14, ExAZ16, Ex335AZ, ExST61 More information: Tell us about your application. Solenoid Interlock Switches Application: to insure that sliding, hinged and removable guarding devices on machines cannot be opened until dangerous conditions have been terminated. Actuation: various key-type devices Hazloc certifications: cCSAus, ATEX, IECEx, GOST-R, Inmetro. Typical Models: ExSTM295, ExAZM415, ExAZP415 More information: Tell us about your application. Door Contact Application: to monitor the closed condition of elevator doors for operational safety. Featuring positive break contacts. Actuation: coded actuator attached to moving part. Hazloc certifications: cCSAus, ATEX, IECEx, GOST-R, Inmetro. Typical Models: Ex14AZ More information: Tell us about your application. Safety Sensor Application: to monitor the position of sliding, hinged and removable protective doors. Magnetic coupling between sensor and actuator. Used with electronic relay. Actuation: coded actuator attached to moving part. Hazloc certifications: cCSAus, ATEX, IECEx, GOST-R, Inmetro. Typical Models: ExHSSi4, ExRCSiM30, ExRCSi56 More information: Tell us about your application. 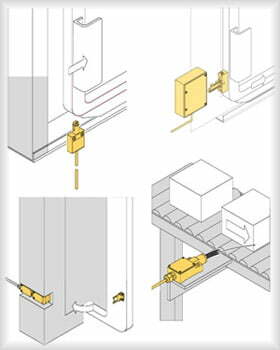 Safety Switches for Hinged Guards Application: to monitor the relative position of hinged doors or protective guards. Actuation: direct coupling to rotating hinge component, or via lever attached to door/guard. Hazloc certifications: cCSAus, ATEX, IECEx, GOST-R, Inmetro. Typical Models: Ex13SB, Ex335V10S More information: Tell us about your application. Command Safety Switches Application: to start or stop control system functions and provide two-handed interlocks. Emergency stop ciricuits. Actuation: push button, semi rotary, and key operated. Hazloc certifications: cCSAus, ATEX, IECEx, GOST-R, Inmetro. Typical Models: Ex14RT More information: Tell us about your application. Foot Switches Application: operator foot control to stop & start machinery and process operations. Actuation: one, two, or three pedals, with or without guard covers to prevent accidental operation. Hazloc certifications: cCSAus, ATEX, IECEx, GOST-R, Inmetro. Typical Models: ExGF, ExGFS, ExGFI, ExGFSi, ExGF2, ExGFS2, ExGF3, ExGFS3 More information: Tell us about your application. Emergency Pull-Wire Switches Application: operator safety over-ride of machinery and process operations, including conveyor systems. Actuation: pull-wire from one or both sides. Push button or key reset. Hazloc certifications: cCSAus, ATEX, IECEx, GOST-R, Inmetro. Typical Models: ExZS71, ExZS73, ExZS75, ExZS80, ExZS73S, ExZS75S More information: Tell us about your application. Pull-Wire Switches Application: simple one pull initiation of electrically powered doors, gates and processes such as a hanging cord for fork lift truck drivers. Actuation: pull-wire from one side, spring return. Hazloc certifications: cCSAus, ATEX, IECEx, GOST-R, Inmetro. Typical Models: Ex61Z More information: Tell us about your application. Belt Alignment Switches Application: mounted each side of a materials handling conveyor to monitor belt alignment and initiate warning of imbalanced loading or mechanical failures. Actuation: lever mounted roller. Push button reset. Hazloc certifications: cCSAus, ATEX, IECEx, GOST-R, Inmetro. Typical Models: Ex3354VSR, ExZS73SR More information: Tell us about your application.